I pulled up in the car park at Lane End and spotted Paul (@paulgbuck) and Col (@colinastbury) over to the right, so hobbled over to meet them. Quite a bit of time was spent milling around while we tried to decide whether Phil (@daylightGambler) had actually already turned up or not. He’d got a new car and none of us seemed to know what it was so couldn’t tell by looking around the car park. Eventually we got on our way. He’d either be waiting for us at the rendezvous or sod him he could try to catch up. With the damage to my foot, I’d already decided not to do the full walk, and my plan was simply to wander upstream to join Phil and his friend Sarah (@PascallSarah) at the point of their planned wild swim, then have a brew and a bit of a sit and then go back to the car to await the others. We headed along the faint and meandering path that runs alongside the leat, took a detour up to bag Nat Tor just above us, and then found ourselves fighting our way through vegetation to make further progress upstream. Several bigger patches of water were spotted and we scanned the area for any sign of Phil and Sarah. Finally we found spotted them in the distance, having already had their swim and went over to meet up. By this point my foot had started to feel a lot better, until I managed to plunge it into a hidden dip in the path and a bolt of agony shot up my leg. I really wasn’t up for a long walk, and wanted to preserve my chances of still doing the SWCP the following week. 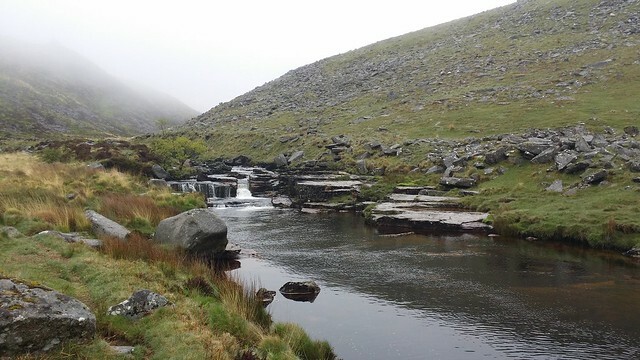 But now a dilemma – I could either return down the Tavy and alongside the leat to the car, a painful and slow process given the uneven ground. Or I could stick to grassier terrain by climbing up over the tors above. I went with the latter, and so stayed with the others for the next part of the walk. I could always shortcut back to the car at any time. 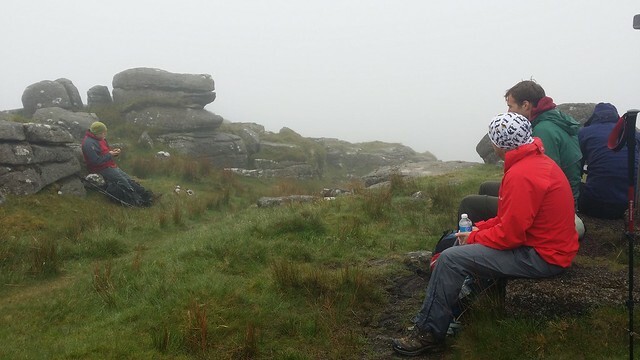 We arrived at the first of the Tavy Cleave Tors and admired the view. 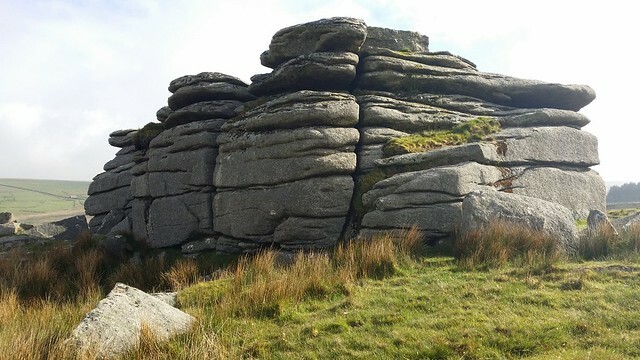 The view didn’t change much as we visited all of the outrcops, including the one that does have its own name – Sharp Tor (Tavy Cleave). 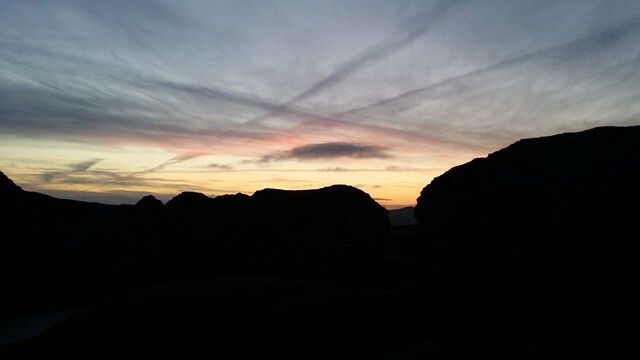 My foot was feeling ok, so almost without thinking I simply stayed with the guys as they turned to head for Hare Tor. This turned out to be another of those tors with several outcrops sufficiently far apart that they should really have separate names. We dropped down to Little Hare Tor, cutting short the original planned walk over Rattlebrook Hill. In these conditions no one was really up for the full walk, and this suited me perfectly. 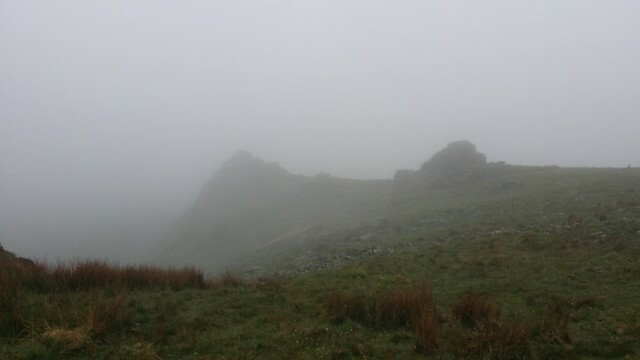 We cut across country to find Ger Tor, invisible in the murk until we got close. It was then a simple matter to return to the cars. Paul, Col and I reassembled in the Fox Tor Cafe to consider our options. We had planned an excursion around the West Dart and a wild camp to the north of Two Bridges, but enthusiasm for this plan was non-existent. I wasn’t really up for that sort of walk given my foot. 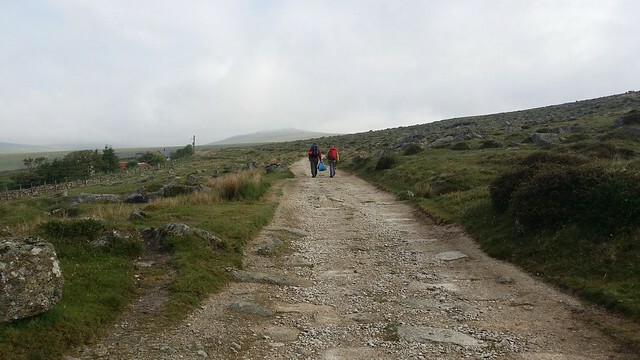 Paul wasn’t bothered about camping in rubbish conditions – he was down for the week doing a version of the Perambulation of the Forest for charity and would be camping on that several nights. Col I sensed wanted a camp of any sort. and donate on Just Giving. Phil joined us as we relocated to the Plume and there as the sky brightened outside along with our spirits due to application of Jail Ale, we hatched a new plan. 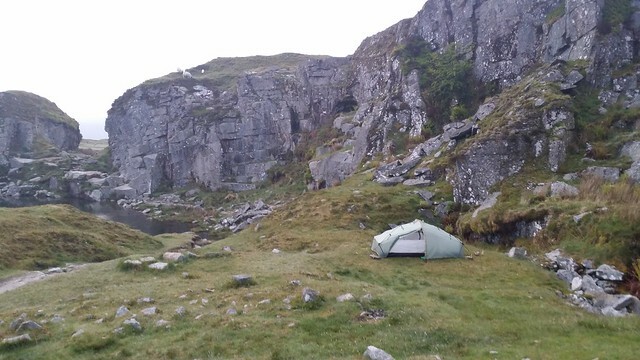 A camp was all we really wanted, so we decided to head out west from Princetown and have one only a short walk away. 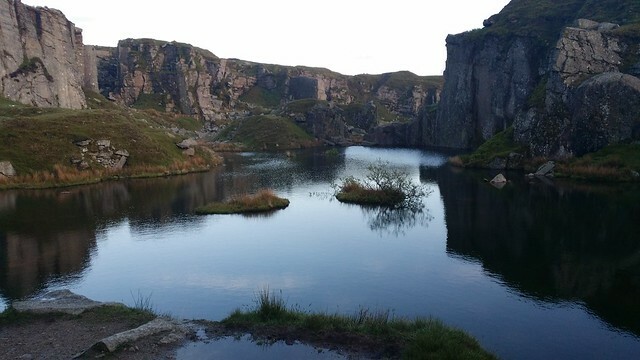 Paul headed to base camp and the three of us remaining started the walk out along the old railway track to Foggin Tor, a favourite of his because of the opportunities it provides for a wild swim. 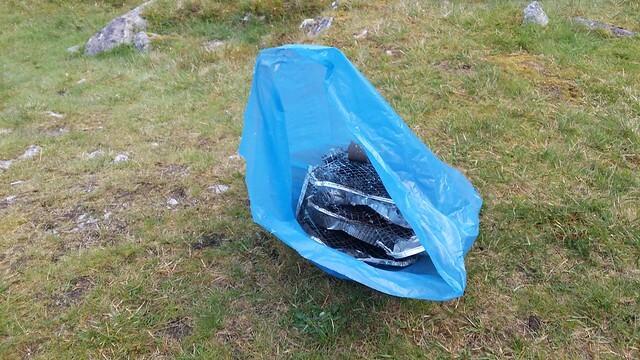 We found a platform to pitch the tents on, and plenty of evidence that others had done so – fire-scarred ground, a discarded camping chair bag, disposable barbecues and a wrapper from a 6-pack of Fosters. They couldn’t even drink something decent. Not unsurprisingly the ground was a tad hard, and I had to move to a lower spot to find ground that would yield to my pegs. We had some dinner and drank some whisky as the sun finally came out just in time to set again. A fox loitered around the back of the quarry and I scampered back to Monica which I’d left wide open and plunderable. It was getting cold so I also turned in. The first look out of the tent next morning yielded the same weather as the previous morning, great. We packed up and decided to return to Princetown by way of the North Hessary set of tors, laden with a bag of Other People’s Crap. The trip ended with breakfast in the Fox Tor Cafe and then Colin and I began our drives back to Essex. Great write up Matt. 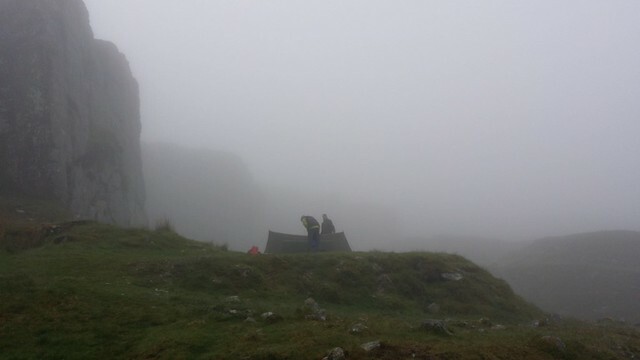 It’s true, having missed the camp on my previous trip due to bad weather I hoping not to have the same happen again :). Great camping spot and the weather turned out alright in the end. 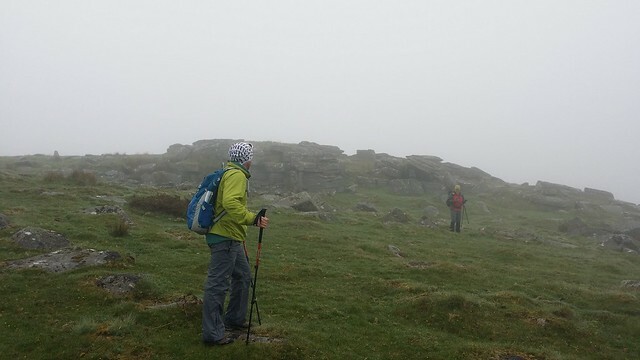 Nice photos BTW, it doesn’t look quite as bad as I remember on the Tavy Cleave walk. Have fun on the SWCP this weekend, hope the foot holds up okay. Matt, I admire the way you clear-up other peoples rubbish. It angers me, especially when they can carry the stuff in but, when finished with it, for some reason they can’t take it with them. I use to do the same, and feel a sense of pride in myself but, at the end of the day, that isn’t why I went hiking/canoeing/mountain-biking, and put a stop to it. It still pains me to this day, 35-years later.